The spine consists of a series of vertebrae that are stacked on top of one another from the neck to the pelvis. These vertebrae are connected and kept in the correct position by the discs that are between the vertebrae and also the facet joints that interlock with one another. There are also supporting ligaments and tendons. The discs between the two adjacent vertebrae are composed of a central, soft, jelly-like substance, called the nucleus pulposus, and an outer, tougher fibrous part, called the annulus fibrosus. In some cases the tough annulus fibrosus becomes damaged and tears, leaving a defect in the strong outer layer. A bit of the nucleus pulposus can then push through this tear and end up in the spinal canal and press against the nerves in the spinal canal (see the figure below). This can be caused by a traumatic injury, but is usually due to an inborn predisposition towards weak discs. The spinal cord extends from the brainstem to the lower spine and ends just below the level of the thoracic and lumbar spine junction. A slipped lumbar disc simply compresses nerve roots that are dangling in the spinal canal. This is because there is no spinal cord at this level, but only nerve roots that originate from the spinal cord. A herniated cervical or thoracic disc, on the other hand, can compress the cord or the nerve roots as they leave the spinal cord. The four stages of disc damage, leading to herniation (prolapse) of disc material. A: Annular tear. At this stage the disc is intact and there is only a small tear in the tough outer layer (annulus fibrosus). B: Disc prolapse. The soft centre of the disc (nucleus pulposus) is now starting to protrude from its normal position, but is still contained within the outer layer. C: Disc extrusion. At this point the soft nucleus has broken through the annulus fibrosus. D: Disc sequestration. At this point the nucleus has broken through the annulus fibrosus and a piece of the nucleus has broken off from the rest and is lying loose in the spinal canal. When the part of the nucleus that herniated compresses the nerves in the spinal canal, you may experience back pain and pain in one or both legs. Some people experience pins and needles in the legs and feet. Pain and discomfort may also be sensed in the hip, between the shoulder blades and in the groin. Later on, symptoms such as weakness and unsteadiness of the legs and feet, may be experienced. In Cauda Equina syndrome the nerves to the bladder and bowel are affected, leading to dysfunction of control of the bowel and bladder. A clinical examination by your specialist or therapist will allow for a reasonable suspicion, but the only definite way is by doing a magnetic resonance imaging (MRI) scan (see the section Tests and Scans). Sometimes, because of technical factors, a CT scan is performed (see the section Tests and Scans). This is usually when an MRI scan cannot be performed due to the unavailability of an MRI scanner, when there are contra-indications to doing a scan or when technical factors such as the presence of certain metal fusion apparatus in the spine make an MRI scan unreliable. See the section Tests and Scans for the terminology that you will find on your MRI scan report and what it means in plain English. Other tests that might be used are discograms and nerve blocks. Sometimes electromyograms (EMGs) are also used (see the section Tests and Scans). This drawing illustrates different phases of disc disease. Discs may degenerate with or without accompanying bony outgrowths (osteophytes). Sometimes the disc degeneration will lead to a disc prolapse (disc herniation). 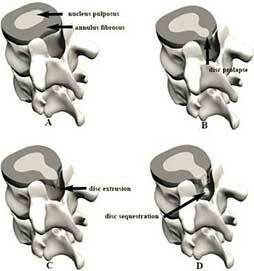 See the first figure for the different stages of disc herniation. No treatment – This is acceptable if there is no serious nerve compression, in other words, there is no spasticity or muscle weakness. There are always people who choose this option for a variety of personal reasons. There is a certain proportion of patients whose symptoms will get better with time without an operation. Non-invasive treatment – The initial treatment for a lumbar disc herniation is conservative treatment, which might include anti-inflammatory medication, analgesic medication, physiotherapy and other manual treatments such as chiropractic treatment, pressure point therapy, massage therapy and traction. This would usually be followed for a period of at least six weeks. Semi-invasive treatment – This includes procedures such as radiofrequency rhizotomy, caudal or sacral block, epidural block and Nucleoplasty. These treatments may be highly effective, have very few side-effects or complications and are performed as day procedures. These procedures have a very definite place in the non-surgical management of lumbar disc disease. If conservative management is unsuccessful, surgery is usually indicated. In situations where there is muscle loss or sensation loss due to a compressed nerve, surgery is considered much earlier. Compression that continues for too long can cause permanent nerve damage. The longer the duration of the symptoms, the less the chance of success when operating to decompress the nerves. 2. Pain that does not respond to any other treatment modality and is sufficiently severe to limit your daily activities and quality of life. This includes local lower back pain, referred pain and radicular pain. 4. Spasticity of the legs. 5. Cauda Equina syndrome or Conus Medullaris syndrome. These are serious conditions that are characterised by weakness, sensory loss and bowel and bladder dysfunction. These are emergencies that require immediate surgery. There is a whole spectrum of operations that might be suitable for treating a prolapsed (herniated) disc. Please see the relevant chapter regarding the procedure that your specialist is suggesting. The most common complications of surgery are infection and wound haematoma (bleeding under the skin). The most feared complication is nerve damage, but this is extremely rare, although not unknown. The sleeve of dura that surrounds the spinal nerves can also be torn and this may lead to a leakage of spinal fluid (cerebrospinal fluid). This needs to be repaired. Speak to your specialist about a more comprehensive list of possible complications (see the section Your Back Operation). Lumbar degeneration and lumbar disc disease are progressive entities. In cases where the disease is conservatively managed, it is possible that the herniated portion may retract and no longer cause symptoms or require surgery. When only a portion of the slipped (herniated) disc is surgically removed, there is a possibility that another piece of the remaining disc may herniate and compress a nerve root, requiring further surgery. When the disc is completely removed and a fusion is formed, this may accelerate the degeneration process in the adjacent discs. It is obvious that disc degeneration is a progressive entity that may well require further treatment in the future, no matter what treatment is instituted.